17.2 Overview of the Problem. 17.3 Overview of Bicycle Parking Strategies. 17.4 Implementing Bicycle Parking Strategies. 17.6 References and Additional Resources. This lesson on bicycle parking and storage has been primarily derived from the "Bicycle Parking" chapter of Implementing Bicycle Improvements at the Local Level. (1) Other sources of information are listed at the end of the lesson. Providing secure bicycle parking is a key ingredient in efforts to encourage bicycling at the local level (see figure 17-1). Many bicycle trips end somewhere other than the bicyclist’s home, and as a result, the bicyclist must park his or her bicycle. And for those who live in apartment complexes, college dormitories, or other high-density settings, the issue of where to leave a bike while at home is also a serious issue. In short, at one time or another, most bicyclists have experienced the frustration of finding no secure place to leave their bikes. While providing secure bicycle parking is not the entire solution to the problem of theft, it certainly can help, and it can increase bicyclists’ comfort in leaving their bicycles unattended. As a result, many bicycle owners may be encouraged to make bicycle trips that they might otherwise forego. Figure 17-1. Photo. Effective bicycle parking improves security and reduces theft. Install bicycle parking at public centers. Install bicycle parking on public rights-of-way in neighborhood commercial and downtown business districts. Encourage private businesses to provide bicycle parking for their customers. Install bicycle parking at transit stops and in parking garages. Encourage the installation of high-security bicycle parking at existing worksites, schools, and high-density residential developments. Encourage existing businesses to provide bicycle parking for their customers. Add provisions to local zoning regulations requiring bicycle parking as part of new developments, particularly commercial, public, and high-density residential developments. Make these requirements part of the process of getting a building permit. Typically, the provision of bicycle parking at public facilities helps to convince business owners of the need for bicycle parking on private development. The use of zoning regulations or bicycle parking ordinances helps in the long-term to ensure bicycle parking in newly developed areas. Bicycle racks. These are open-air devices to which a bicycle is locked and work well for short-term parking. Bicycle lockers. These are stand-alone enclosures designed to hold one bicycle per unit and are a good choice at sites that require long-term parking for a variety of potential users. Bicycle lock-ups. These are site-built secure enclosures that hold one or more bicycles and are often used for long-term parking for a limited number of regular and trustworthy users. Figure 17-2. Illustrations and photo. Examples of common bicycle parking devices. This section describes one possible approach to implement bicycle parking. Other approaches are possible and encouraged, particularly if the bicycle parking program is managed by city or county government. This approach is organized chronologically by major steps. Each of the strategies described previously requires the cooperation of a different group of constituencies. Bicycle parking in public spaces requires the cooperation of public agencies who control or manage the property involved. Sidewalks are typically controlled by the streets or public works department, whereas a parks and recreation department typically has responsibility for open spaces and recreational areas. There may be an agency (similar to the Federal Government’s General Services Administration) in charge of all public property. Or agencies that run specific services (e.g., libraries, public health clinics) may control their own sites. Encouraging businesses to install bicycle parking may require the cooperation of such groups as the local chamber of commerce, downtown business association, or shopping center manager. In addition, agencies that routinely deal with businesses should be enlisted as outlets for any literature developed as part of the program. Altering zoning regulations to require consideration of bicycle parking in new developments requires close cooperation with city planning and zoning agency staff, as well as assistance from appointed zoning boards and builders’ associations. Typically, regulations are revised on a schedule; therefore, the time or opportunity to revisit bicycle parking requirements will need to be coordinated with these schedules. In some communities, a reactive program that simply fills orders and answers questions can be successful. This success would be most likely in a bicycle-friendly community with a high degree of interest in bicycling matters. However, in many places, a reactive approach will result in little and disorganized response. Business owners and managers of large employment centers or residential complexes often see bicycles as clutter and a problem to be eliminated rather than as a solution to traffic congestion or air quality problems. As a result, a successful bicycle parking program should include elements of marketing and promotion. Task Group 1: Public Bicycle Parking. Install bicycle parking on public rights-of-way. Task Group 2: Private Bicycle Parking. Encourage installation of high-security bicycle parking at worksites, schools, and high-density residential developments. Task Group 3: Zoning Regulation Revision. Add provisions to local zoning regulations requiring bicycle parking. Visual observation: Look for where bikes are parked illegally due to lack of legal parking. The (car) parking patrol people can probably do this for you in a week. User input: Ask bicyclists (through clubs or advocacy groups) to create a list of most-needed spots for bike parking. Land use criteria: Target every coffee shop, bookstore, video arcade, teen/young adult clothing store. Public-private partnership: Have a grant program whereby businesses can request bike parking for customers and employees, paying for the installation themselves, but getting the racks paid for by the grant. Building code: Require all new development or change of business to install bike parking proportionate to car parking requirements. More scientific criteria may be useful for determining exactly what kind of bicycle parking device to install and exactly where. Visibility: Cyclists should easily spot short-term parking when they arrive from the street. A highly visible location discourages theft and vandalism. Avoid locations "off on the side," "around the corner" or in un-supervised parking structures or garages. Access: The parking area should be convenient to building entrances and street access, but away from normal pedestrian and auto traffic. Avoid locations that require bicycles to travel over stairs. Security: Surveillance is essential to reduce theft and vandalism. For security, locate parking within view of passersby, retail activity, or office windows. Better yet: officially assign building security, a parking lot attendant or other personnel to watch for suspicious behavior. Lighting: Bicycle parking areas should be well lit for theft protection, personal security and accident prevention. Weather protection: Whenever possible, protect bicycle parking area from weather. An existing overhang or covered walkway is recommended. Alternatively, construct a canopy or roof—either freestanding or attached to an existing building. Avoid conflict with pedestrians: Locate racks so that parked bicycles don't block the pedestrian path. Select a bike rack with no protruding bars that could trip or injure cyclists or pedestrians. Very low bar-type racks can be a hazard to pedestrians and are not recommended. Avoid conflict with automobiles: Separate bicycle parking, auto parking, and road areas with space and a physical barrier. This prevents motor vehicles from damaging parked bicycles and keeps some thieves at a distance. Most professional bike thieves use vans or similar vehicles to hide their activities and make a getaway with their loot concealed. The closer bicycle parking is to automobile parking, alleys, roads, etc., the better the opportunity for a bike thief. Racks should be located within 15.2 m (50 ft) of building entrances (where bicyclists would naturally transition into pedestrian mode). Racks should be installed in a public area within easy viewing distance from the main pedestrian walkway, usually on a wide sidewalk with 1.5 m (5 ft) or more of clear sidewalk space remaining (a minimum of 61 cm (24 in) of clear space from the parallel wall and 76 cm (30 in) from the perpendicular wall). Racks are placed to avoid conflicts with pedestrians. They are usually installed near the curb and at a reasonable distance from building entrances and crosswalks. Racks can be installed at bus stops or loading zones only if they do not interfere with boarding or loading patterns and there are no alternative sites. As described earlier, bicycle parking can be accomplished with three basic devices: racks, lockers, or lock-ups (see figure 17-2). Packets of information should be assembled for available bicycle parking devices, along with the pros and cons of each device. In a joint meeting(s) with all three task groups, adopt a set of criteria and decide which devices are to be endorsed. Typical criteria used to evaluate bicycle parking devices are security (and how well the device works with common bicycle locks), durability and resistance to vandalism, ease of use, aesthetics, and cost. Support the bicycle upright by its frame in two places. Prevent the wheel of the bicycle from tipping over. Enable the frame and one or both wheels to be secured. Support bicycles without a diamond-shaped frame with a horizontal top tube (e.g., a women’s or other frame). Allow front-in parking: a U-lock should be able to lock the front wheel and the down tube of an upright bicycle. 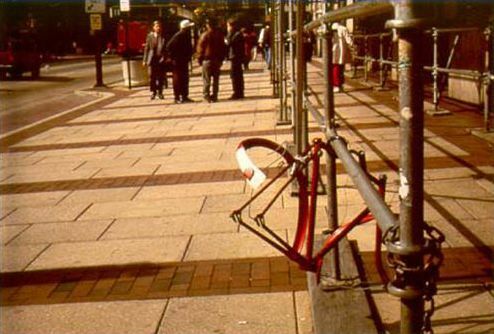 Allow back-in parking: a U-lock should be able to lock the rear wheel and the seat tube of the bicycle. Resist being cut or detached using common hand tools. Not bend wheels or damage other bicycle parts. Accommodate high-security U-shaped bike locks. Accommodate locks securing the frame and both wheels (preferably without removing the front wheel from the bicycle). Not impede or interfere with pedestrian traffic. Be easily accessed from the street and protected from motor vehicles. Be visible to passersby to promote usage and enhance security. Be covered where users will leave their bikes for a long time. Have as few moving parts as possible. Accommodate a wide range of bicycle shapes and sizes. Figure 17-3 illustrates a variety of bicycle racks that meet these requirements, whereas figure 17-4 illustrates types of bicycle racks that are not recommended because they fail to meet one or more of these requirements. The average cost for typical bicycle racks ranges from $75 to $100 per rack; a single rack typically holds one or two bicycles. The cost for bicycle lockers ranges considerably more, from about $500 to $1,500 per bicycle. Figure 17-3. Illustrations. Recommended types of bicycle racks. Figure 17-4. Illustrations. Bicycle rack types that are not APBP-recommended. In addition to the basic bicycle rack design, the layout of bicycle rack areas will need to be designed. The APBP Bicycle Parking Guidelines provides some minimum recommended dimensions for bicycle rack areas (see figure 17-5). (3) Their guidelines also suggest that large rack areas with a high turnover rate have more than one entrance. If possible, the rack area should be protected from weather elements. Figure 17-5. Illustration. APBP-recommended design dimensions for bicycle rack areas. The first task group should set criteria for installing bicycle parking on sidewalks as well as at public destinations. For sidewalks, criteria could include such items as minimum width of sidewalk, rack position on sidewalk and proximity to other street furniture and vegetation, and number per block or number per site. For public sites, they could include proximity to the main entrance, and minimum number of bicycle parking spaces per installation (i.e., based on the type of facility served). Next, they should create a step-by-step procedure for planning and installation. This should include initial identification of the potential site, discussion with relevant agency personnel, determination of the specific site’s needs (number of parking devices and location), cost analysis and budgeting, procurement, installation, and followup. To support this activity, they should create a project sheet for rack installation that includes places for the source of the request (if any), signatures of any required agency personnel, a schematic diagram of the site, installation date, and any comments. Next, they should estimate the total bicycle parking need for public places given a list of potential sites. Estimates can be conservative and based to some extent on existing bicycle traffic, as long as participants recognize that latent demand may be significant. For this reason, phased installation may be particularly appropriate. For sidewalks, a base number of racks to be installed during a fiscal year (e.g., 100, 500, or 750) should be decided, along with a map showing priority areas. For instance, downtown might be a top-priority area, neighborhood commercial areas could be second, and strip development areas might be third. Finally, the first task group should set an annual budget for the program and decide how the bicycle parking will be funded. Potential sources include a wide variety of Federal transportation programs, as well as local funding opportunities. The second task group should assemble a packet of information for potential private-sector bicycle parking providers. The packet should include a cover letter describing the importance of bicycle parking to businesses and giving any organizational endorsements for the program; a list of available parking devices, along with information on how to order them and which are best suited for which settings; tips on deciding how many bikes need to be accommodated; and tips on locating and installing the devices. The second task group should also work out details of any promotional activities that will need to be planned. For instance, they should develop a list of groups to talk with, determine who should be responsible for reaching each one, and start making contacts. To this end, the task group should develop a standard presentation, possibly including slides and handouts. The third task group should start by identifying passages in the existing zoning codes where motor vehicle parking is discussed. They should find out when the regulations are going to be modified and use that in determining their schedule of work. They should then assemble sample bicycle parking laws from other communities. Based on the sample laws, they should create a draft revision to the regulations and circulate it for comment. Once comments have been received and considered, they should forward a final draft revision for action at the proper time. Number of spaces required. Bike parking ordinances should clearly indicate how many bicycle parking spaces are required, either as a function of the type of development (retail, office, residential, etc.) or as a standard percentage of the required off-street automobile parking. For example, the City of Denver requires that off-street automobile parking facilities of 20 spaces or more provide bicycle parking equal to 5 percent of the automobile parking space requirement. Type(s) of permitted racks. Bicycle racks that support the bike by the wheel should not be permitted. Location of bicycle racks. Bicycle racks should be located at least as close to the building entrance as to the nearest parking space (excluding accessible parking spaces). Other elements. The requirements can also address lighting of bicycle racks, requirements to retrofit existing public buildings, and protection from weather. A growing number of communities have included bicycle parking requirements in their development regulations. By so doing, they ensure that bicycle parking is included in the normal course of development. Figure 17-6 contains excerpts about bicycle parking from the off-street parking ordinance in Madison, WI. (5) Figure 17-7 illustrates the City of Philadelphia’s standard for bicycle rack placement in business districts. (6) Bicycle parking ordinances from numerous other cities can be found by searching a particular city’s website for their planning, development, or land use ordinances. With the program established, materials prepared, and initial funding identified, implementation of the program can begin. Routine responsibilities for the various tasks should be taken care of by the agencies identified through the previous steps. Oversight of the program may require the attention of a project coordinator. This may be a task delegated to a member of the planning department or public works staff. As the work is proceeding, keep track of successes and failures. Early on, get the word out to the bicycling public that: (1) the program exists and (2) they should submit comments and ideas for potential parking sites. Keep a record of how many parking devices have been installed, how many comments have been received, how many information packets have been sent out, what proportion of public places has adequate bicycle parking, how well the parking is working (i.e., whether the public likes it, whether it holds up well to vandalism), and how successful the zoning regulations appear to be (once they are adopted). Use this feedback to fine-tune the program and determine future levels of funding. Figure 17-6. Photo. Excerpts from off-street parking ordinance in Madison, WI. (l) 1. a. In all cases where bicycle parking is required, no fewer than two spaces shall be required. b. After the first fifty (50) bicycle parking spaces are provided, additional bicycle parking spaces required are 0.5 (one-half) space per unit listed. Figure 17-7. Illustration. Philadelphia’s standard for bike rack placement in business districts. Do an inventory of need for bicycle storage facilities and a preliminary site design for an activity center in your community. Develop a bicycle parking ordinance for your local community. Have students consider the features discussed in this chapter. Williams, J., B. Burgess, and B. Wilkinson, Implementing Bicycle Improvements at the Local Level, FHWA, Publication No. FHWA-RD-98-105, Washington, DC, 1998. Bicycle Parking Criteria, Bike Rack, Bicycle Locker, Cycle Stands & Bike Storage Systems, IBF, 2004, available online at http://www.ibike.org/engineering/parking.htm, accessed March 9, 2004. Bicycle Parking Guidelines, Association of Pedestrian and Bicycle Professionals, Spring 2002, available online at http://www.apbp.org/pdfs/bikepark.pdf or http://www.bicyclinginfo.org/pdf/bikepark.pdf, accessed March 23, 2004. Code of Ordinances, City of Madison, WI. City of Philadelphia Bicycle Parking Specifications, 1998. Bicycle Parking, Bicycling Info Website, available online at http://www.bicyclinginfo.org/de/park.htm, accessed April 12, 2004. Bicycle Parking Facility Guidelines, City of Portland, OR, Office of Transportation, available online at http://www.trans.ci.portland.or.us/bicycles/parkguide.htmbicycles/parkguide.htm, accessed April 20, 2004. Fletcher, Ellen, Bicycle Parking, 1990. Pro Bike News, Bicycle Federation of America, April 1996. Source Book of Designs, Manufacturers, and Representatives, Bicycle Federation of America, 1992.